On April 20th we drove a few hours south to our hometown of Fresno, CA. Our friends at Tioga Sequoia Brewing Co. opened up the doors to their brewhouse and taproom and we brewed something a little outside their comfort zone. TSBC are known locally for their aromatic IPAs and crisp lagers and in the beer trading community for their adjunct and barrel aged stouts. So... of course... we went a totally different direction for our collaboration. Using their 2bbl pilot brewhouse we split a batch into two Speidel fermenters and pitched Lactobacillus Plantarum (a souring bacteria). The next day we returned and pitched 2 different Brettanomyces isolates from The Yeast Bay. In a few more weeks we will return to check that they are done fermenting before dry hopping and packaging. We will also be sure to visit our parents this time (sorry mom). Back in August of 2016 we worked with FreeWheel Brewing Co., known for their English style ales, to see what a saison on cask would be like. It was a very popular option in their taproom that summer so we wanted to make an equally refreshing option for their customers this summer. Our goal is something a little unusual... a largely undefined style referred to as "Graf" which is a hybrid between beer and cider. We brewed a wort utilizing english malts and hops and called our friends at South City Ciderworks to get some of their house juice blend. We added the juice to the wort (about 35% juice by volume) and fermented with an Belgian Abbey style yeast that was actually isolated from a from a Belgian-style beer produced by a brewery in the North-Eastern United States. You can expect to find this refreshing 5%-6% experiment on draft in the San Francisco Bay Area in the next couple months. In our last blog we covered our recent collaboration with Steve Doty at Shady Oak Barrel House and our experiment with dried Persian limes. That beer, released under Steve's "Cellar Wizard" series came out great. This, however, was not the first of our efforts with SOBH to create an awesome beer. Roughly 8 months ago we began working with Steve and he started teaching us about sourcing barrels, wort, working with funky yeast and bacteria, etc. With our creative input and utilizing some of the connections we had made, SOBH filled a few with a saison base and fermented it with cultures from Nick Impellitteri at The Yeast Bay in San Leandro, CA. These beers have now been packaged and are currently conditioning in bottles and keg. We will be releasing a tart, mixed-culture saison hopped with Czech Saaz and a golden sour ale hopped heavily with Ekuanot. You can expect to see these in July. Due to our involvement in every step of the creation of these beers, we feel these releases will most closely represent the styles of beer you can expect from AltBrau when we launch our commercial operation. Although we have stayed very busy with collaborations, we have made sure to make time for small batch experimentation and recipe testing. These 3-8 gallon batches serve as the basis for our future commercial releases and it's important that we learn as much as we can about ingredient interactions, how much carbonation to shoot for, and the behavior of various yeast strains. We recently had some issues with some of our wild yeast/bacteria captures and had to dump several bottles. It may seem easy to do so on such a small batch, but it was still heartbreaking. We cannot, however, allow subpar product to become part of our normal operations at any scale and we plan to be just as diligent about quality when we reach a commercial scale... even if that means dumping a barrel. On a positive note... we've also had some great results from a recent batch where we used a Nordic farmhouse yeast (Kviek) along with Brettanomyces to create a delicious beer. We bottled that experiment as well as a mixed culture saison, and a blend of those two with authentic Belgian lambic. So where can you try these beers? Every year in Amsterdam the world of wild, sour, funky, and spontaneously fermented beers gather at Carnivale Brettanomyces. Over the course of four days a combination of professional and amateur brewers and blenders are featured at several local beer bars, breweries, and restaurants and a wide variety of beverages are served. AltBrau has had the distinct honor of being invited to pour our beers at the homebrewers event on Thursday June 21st at Oedipus Brewing. If you'd like to try our collaboration beers with Shady Oak or our recent test batches this is the perfect place. Throughout the weekend you will also be able to try beers from such producers as Drie Fonteinen, Trillium, Bokkereyder, Saint Somewhere, h.ertie, and many many others. We are excited to attend a dinner featuring the beers of Tommie Sjef and to see our friends (and old collaborators) Trevor and Linsey Rogers from De Garde. Antidoot is the creation of Tom and Wim Jacobs, two brothers from Kortenaken, Belgium, about 90 minutes outside of Brussels. Like AltBrau, they making the transition from homebrewers to commercial operation. On their property they have constructed their own farmhouse brewery and barrel house and create beers using native/indigenous yeast and bacteria that grows amongst their grape vine and apple trees (they also make wine and cider). We have been invited to stay on the farm in the days following Carnivale Brettanomyces (they will pouring as well) and we plan to brew a few batches on their system. We will be joined by a few other friends and brewers on these collaborations including Aiden from Bretty Fingers and staff from Nevel Artisan Ales. Tucked away in a warehouse in downtown Santa Rosa, CA is an amazing one-man brewing operation you may not have heard about if you aren't a NorCal local. Steve Doty has been releasing various oak aged, mixed culture beers under the name Shady Oak Barrel House over the last four years and has been very well received by craft beer fans in his native Santa Rosa as well as beyond. 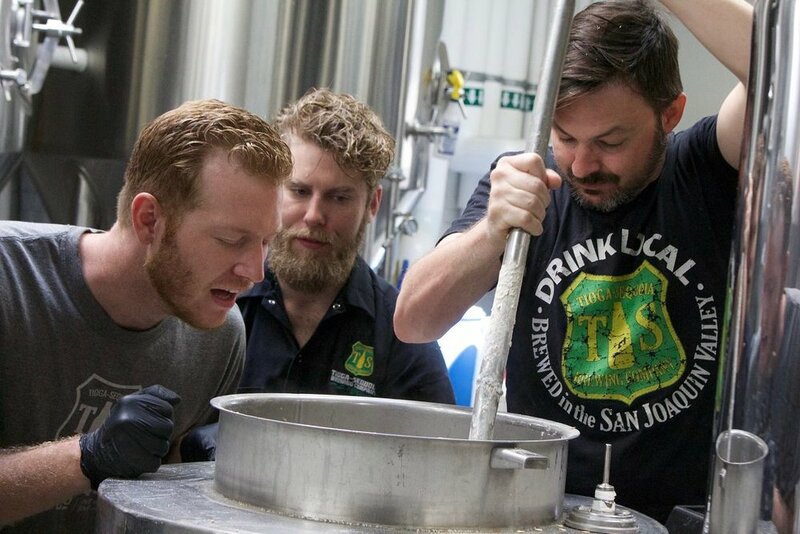 In 2016 he was ranked as one of the top new brewers in the world according to RateBeer.com. Having been a fan of his beers we reached out and began a dialogue that eventually lead to a great friendship. A few months ago Steve invited us to his facility and along with a mutual friend we tasted a variety of barrels. Once we had selected a few contenders we began discussing interesting additions we might be able to make. We introduced Steve to Amani/Omani limes, dried Persian citrus traditionally used in dishes throughout Iran and Iraq (more info here). These limes added a candied lime and margarita quality when paired with one of the funky golden base beers we had chosen. We decided to add some complimentary hop character by adding Citra and Amarillo and Steve blended just a touch more acidity into the mix from a second barrel that had a stronger lactic-acid character. We packaged our collaboration and it took a rest in bottles so carbonation and refermentation could gently take place. We have seen this beer slowly trickle out of the barrel house at occasional events this month as one of Steve's special releases he calls the Cellar Wizard Series. Be sure to follow Shady Oak on Facebook and Instagram if you'd like to know when and where you might find this rare beer. We're big fans of mixed culture brews of all kinds, but the most enticing and exotic feature yeast and bacteria not grown in labs. These beers utilize wild or native cultures unique to their location/terroir. Breweries such as Jester King, De Garde, Logsdon, and Russian River have been experimenting with spontaneous fermentation in the United States for years. The most famous wild ales, however, are the Lambic and blended Geuze from Belgian brewers such as Boon, Drie Fonteinen and Cantillon. The idea of utilizing a native yeast for an Oakland inspired saison has been rattling around our brains for a bit. So... after utilizing bottle dregs from some our favorite sour brewers for some one gallon experiments, we decided to (attempt to) capture a native Saccharomyces strain. Capturing yeast isn't as easy as leaving some wort out overnight. Well... actually... it can be. This method, however, will also encourage all kinds of bacteria that you aren't necessarily looking for. Since I am not looking to brew a lambic-style beer aged over multiple years, I decided to do my best to avoid capturing any enteric bacteria (such as salmonella). This type of bacteria is very dangerous early in fermentation but serves as a precursor for later yeast/bacteria cultures over very long fermentation. After doing some research on Milk The Funk and Bootleg Biology we reached out to Nick over at The Yeast Bay for some advice how we might increase our odds of successfully capturing what we were looking for. Using his advice we made a 1.030 wort and pre-acidified using lactic acid. We also used grain alcohol (vodka) to keep the wort at approximately 1% abv. Saccharomyces cerevisiae (brewers yeast) is moderately tolerant to both alcohol and acidity while many other types of yeast and bacteria are unable to reproduce in such conditions. 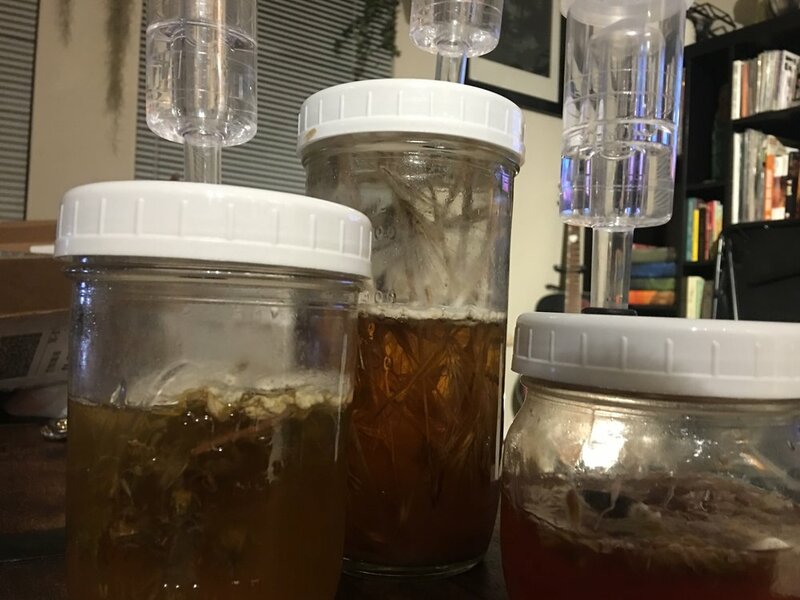 Once we had our wort boiled, pre-acidified, and alcohol added we scrubbed some mason jars and sprayed them with sanitizer (Starsan) and put on their lids. We headed out to the Oakland hills and gathered a variety of wild flowers, weeds, and grasses. We returned home to add the wort and shortly thereafter realized a few mistakes we had made. We will get to those in just a moment. At home we placed airlocks on some handy pickling lids (fitted to screw on to mason jars with a whole drilled out and gasket in place) onto the samples and placed them in a closet. After a week we saw mold forming. Although there is still a possibility of collecting viable yeast from these samples, there is an increased risk of mycotoxins being present in the liquid. After smelling two of the samples (purple wild flowers and dry grass) we decided to dump them. A third sample containing a dandelion-like weed had a pleasant aroma that we want to hold on to. Using a sanitized spoon we removed the plant matter and mold growing on the surface. Our plan is to step up this sample and get it over to The Yeast Bay for analysis if it continues to display pleasant aromas. So what did we do wrong? What could we have done better? Hops and their various oils will tame lactic acid producing bacteria (Lactobacillus). Our goal was to capture a saccharomyces strain so this is just one additional step along with the pre-acidification and alcohol we should have utilized. Upon putting the starter wort over the plants we collected, we noticed a layer of sediment form very quickly. This leads me to believe the dry malt extract we used had not fully dissolved and incorporated into the water. A longer boil will be used next time. Once the wort was boiled and additions were made (lactic acid and alcohol), we left the pot to cool on its own while we left to gather the plants. On a normal day this may have been enough to cool the wort to a pitchable temperature. However... this was during a heatwave and the ambient temperature of the kitchen where the wort was prepped never cooled down. Once the wort was added we noticed how warm it still was. There is a strong likelihood that much of the viable yeast on the plants was killed on upon contact with the warm wort. Mold, although not rare in wild captures, adds substantial risk to being able to isolate a viable sample. These types of mold are typically aerobic and enjoy access to oxygen. Next time we plan on filling the jars much higher with less headspace for less oxygen. Any part of a fruit, vegetable, flower, etc that sits above the surface of the starter wort is going to encourage mold growth. Next time we will likely remove any solids after 48 hours, allowing any yeast enough time to inoculate the starter wort but not long enough for mold spores to get a strong start. Despite our mistakes we had a great time and we look forward to our next attempt. Wish us luck! Although our 2-4 gallon homebrew experiments are a fantastic way to test recipes, we decided to take steps towards our goal of commercial production by doing our first large scale (by our standards) test batch. Our favorite styles of beer have always been mixed culture ales aged in neutral oak so we began working towards sourcing our own Barrels, wort, and yeast/bacteria. Our buddy Jon Frost from Auburn James Winery got us a sweet deal on two 59 gallon 2010 Cabernet barrels that are in great shape. He was kind enough to clean and treat them just after emptying them of their delicious wine and delivering them to our friend's property in Sonoma County. Once we had our barrels and a location to store them, we began arranging wort production, yeast, and transportation. The awesome folks at South City Cider allowed us to borrow a 275g IBC tote designed for liquid transport. We fork lifted the IBC into our rented moving truck and used a few straps and some rope to keep it in place as we went to pickup our wort. We designed a simple recipe of 2-row Pale, Pils malt, and Malted Wheat. 10 IBU. 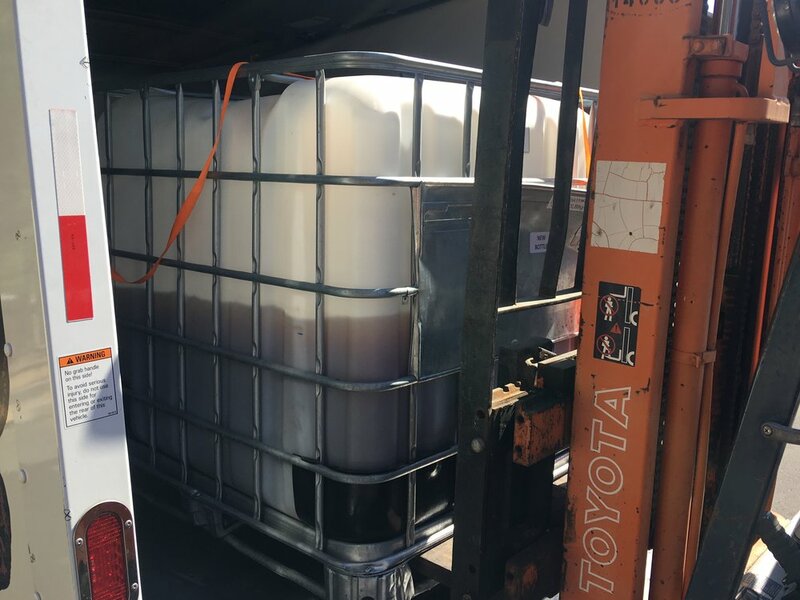 Our friends (and collaborators) at Free Wheel Brewing in Redwood City CA were kind enough to do the wort Production for us. Head brewer Alisha Blue, assistant brewer Erica Dee, and General Manager/Head-of-Sales Devin Roberts all assisted in filling our IBC tote before we did the drive up to our barrels just North of San Francisco. A few hours on a slow and steady drive north and we arrived at our destination. Lucky for us we had access to a borrowed forklift upon our arrival. Primary fermentation took place directly in the IBC using a saison blend from The Yeast Bay (San Leandro, CA) where we allowed the temp to free rise. Normally we would carefully monitor and control fermentation temperature but our intention was to stress the yeast in order to create lots of phenols and esters. These aromatic compounds would likely be unbalanced if we were to bottle the beer after primary but once we introduce brettanomyces, lactobaccilus, pediococcus, etc our hope is that these compounds will serve as precursors for further flavor and aroma development during a long rest in oak. We also wanted a fairly dry beer to go into the barrels so we can package this 5%ish abv beer in 6-10 months. We will be filling barrels this week. In each barrel we will be adding a unique blend of cool cultures from The Yeast Bay as well as some stepped-up bottle dregs from some of our favorite funky/sour beer producers. We are really looking forward to seeing how these beers do in their new wooden homes. Even more than that we look forward to sharing these beers with our friends and family.